Welcome to the official Justin Knebel Memorial Ice Fishing Tournament page! SAVE THE DATE for next year's tournament - February 1, 2020 at Zippel Bay Resort near Williams, MN. Registration is at 9:00 am with lines in the water from 11:00 am - 2:00 pm. All proceeds from this tournament go to the Justin Knebel Endowed Scholarship for UMC athletes. This is a fun family style ice fishing derby, limited number of tickets sold! Learn more about Justin, tickets, rules, lodging, tournament prizes, raffle items, door prizes and sponsoring! Want to become a sponsor or donate items? Find out how! View Photos from the JK Ice Fishing Tournament Facebook Page! road access for driving & parking on the ice. Want to fish a second hole during the tournament? We will be selling tickets for $5/each at the gate! The Justin Knebel Memorial Ice Fishing Tournament will be located near Zippel Bay Resort, Williams, MN on Lake of the Woods. 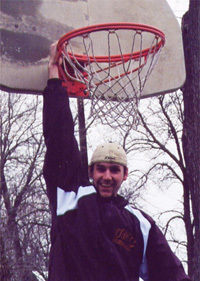 Justin A. Knebel grew up in Warroad, Minn., graduating from Warroad High School in 2001. A talented athlete, Justin lettered in basketball, cross country, and track. He was named All-Conference in basketball as a junior and senior while serving as the team’s captain. As a senior, he was All-Conference in cross country and served as captain of both the cross country and track teams that year. After graduation, Justin attended the University of Minnesota, Crookston where he played basketball as a point guard for the Golden Eagles. Head Basketball Coach Jeff Oseth describes Justin as the ultimate team player working hard on the court and in the classroom. He excelled both athletically and academically. In the fall of 2002, Justin became ill and was unable to participate with the team in conditioning but eventually was cleared to resume activity by his doctor. He was only 19 years old, but Justin had already distinguished himself among his peers as a talented and valuable teammate. The evening before the first official practice was to begin, Justin passed away unexpectedly from complications but left behind a legacy of dedication, determination, and a drive to excel. The inaugural Justin Knebel Memorial Ice Fishing Tournament, held in February 2011, honors Justin’s love of the Warroad area and his passion for outdoor sports in Minnesota. All proceeds from the tournament support the Justin Knebel Memorial Scholarship Fund benefiting students at the University of Minnesota, Crookston. The Ice Fishing is scheduled for Saturday, February 2, 2019 from 11:00 am until 2:00 p.m. on Zippel Bay and Resort, Williams, MN. If ice conditions are not acceptable at the time of the contest an alternate date will be determined and posted at: www.goldeneaglesports.com/teambackers and here, on the official Justin Knebel Memorial Ice Fishing Tournament website. Tickets will be available for $20.00 at the University of Minnesota Crookston Athletic & Development and Alumni Relations Offices, Streiff Sporting Goods in Warroad, MN, and Zippel Bay Resort prior to tournament. Tickets may also be purchased on the day of the contest for $20.00. Only 225 tournament tickets will be sold. Each $20 ticket entitles a person to fish one hole, two holes maximum (second hole tickets can be purchased for an additional $5). You may register as many fish as you want, but only the heaviest fish per contestant will be qualified for a competition prize. No contestant will be eligible for more than one competition prize. There is no age requirement on tournament participation. Contestants may be allowed shelters such as tarp or canvas style temporary houses only; wheelhouses or other permanent movable structures will not be permitted. Contestants are allowed to bring outside food and beverages in the tournament area. There will be pre-drilled holes, however if you are fishing out of a shelter, you must use a pre-drilled hole or drill your own holes. No additional holes will be drilled. All drilled holes must be within the tournament boundaries. All laws (number of species of fish and slot limits) of the State of Minnesota Department of Natural Resources will be abided by and enforced. No fish within the slot limit will be weighted (i.e. a Walleye that is 19.5 to 28 inches must be released and will not be weighted). All fish entered must be brought to the weigh-in station immediately, one at a time and be alive (Grouping of fish WILL NOT be allowed at weigh-in). After fish are weighed in by tournament officials, the fish will be turned over to the angler and they take possession of the fish. Dead or frozen fish are ineligible. Time of the fish will be logged along with the weight and species. If a fish of the same species and weight comes in at a later time, the earlier fish weight in will remain the leader. Tournament officials shall have the right to verify that fish were legally caught. Fishermen are responsible for verification of weight of fish at time of weigh-in. Team fishing is not permitted. Fishermen must fish in the area designated for the ice fishing tournament and will be required to have their tickets available at all times. Ticket checks as well as container inspections will be required. Fishermen are responsible for their own safety and actions at all times. Motor vehicles and ATVs will be allowed to park in the tournament area. Fishermen are required to park in the areas provided outside the tournament boundaries. No bait will be provided or available at the tournament site. No lines are allowed in the water from 10:30 a.m. to the start of the ice fishing tournament. No fishing lines will be left unattended at anytime during the tournament. There will be a Leader Board that will be at the tournament official stand. All efforts will be made to keep the board up-to-date and accurate. Results will remain unofficial until verified by tournament officials. All contestants and others consent to the use of any names and photographs to be used for the promotion of future contests. Please support our efforts to protect the environment and ask that you remove garbage, including cigarette butts, from the ice when you leave. Waste containers will be provided. Questions? Contact Justin Knebel Memorial Ice Fishing Tournament official. 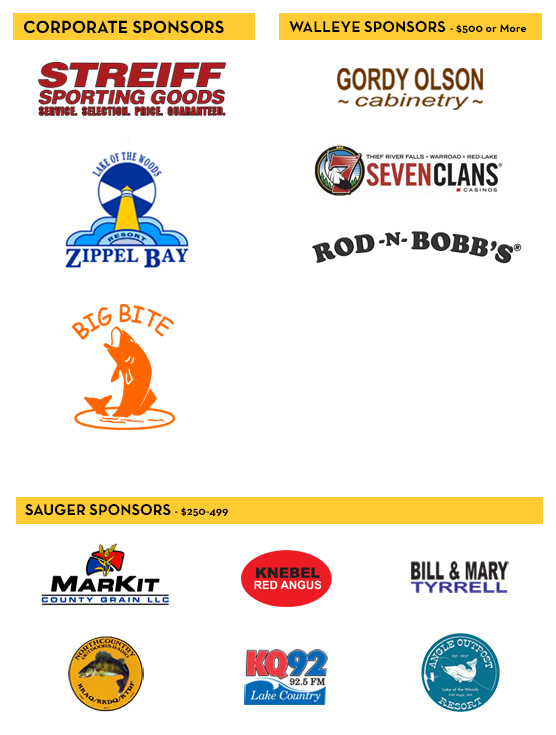 Interested in sponsoring or donating a prize towards the Justin Knebel Memorial Ice Fishing Tournament? Sponsors will benefit from putting their name or products in front of thousands of people through our banners, websites, and tournament day recognition for the Justin Knebel Memorial Ice Fishing Tournament. There are many different sponsorship levels, so please contact us today to find out more! Our goal is to help support businesses that help support the University of Minnesota Crookston (UMC). All money raised goes towards athletic scholarships at the UMC. Interested in donating to the University of Minnesota Crookston through Teambackers, athletic or general scholarships? There are many types of giving opportunities, so please contact our Development and Alumni Relations office today for more details. Q. Can I register more than one fish? A. Yes. You may register as many fish as you want, but only the heaviest fish per contestant will be qualified for a competition prize. Q. Can I use a fish locator or an underwater camera? A. Yes. Electronics are ok to use during the contest. We are abiding by all State of Minnesota Fishing Regulations. Q. Can a friend or family member come and watch me fish if they don’t have a ticket? A. Yes. Spectators are allowed on the ice, including children. Be sure to bring an extra bucket or chair to make it easier for people to stay within your fishing area. Raffle tickets will also be available for sale. Q. Can I fish using a portable fish house or a wind break? A. Yes. Only tarp or canvas style temporary houses allowed. No wheel or other permanent style houses will be allowed. A. Yes. We are abiding by all State of Minnesota Fishing Regulations. Q. Can I park on the ice? A. Yes, within the designated parking area (this will include ATVs). Your fishing ticket includes road access from Zippel bay for on ice parking. Q. Will tickets be available the day of the tournament? A. Yes. If available, tickets may be purchased on the day of the contest for $20.00. Remember, only 225 tournament tickets will be sold. Q. Will there be bait available? A. Not on tournament site. Please bring your own bait. Q. Will there food and/or beverages available? A. Yes. There will a small lunch available for a free-will offering. 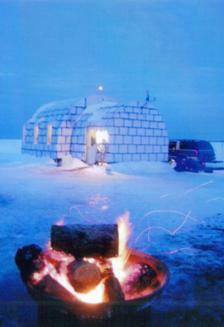 The tournament will be located along the road that the Zippel Igloo resides, an on ice eating/drinking establishment. They even have ice holes available and satellite T.V.! Q. Can I fish without a ticket? A. No. Contestants in the area designated for the ice fishing tournament will be required to have their tickets available at all times. Q. Can I fish two holes? A. Yes. If you purchased a $20 ticket + an extra $5 hole ticket, you can fish two holes. Tickets must be available at all times. Q. Can I drill my own hole? A. Yes. There will be pre-drilled holes, but if you choose to drill your own it must be within tournament boundaries. Q. Can I keep the fish I catch? A. Yes. You must abide by all of the State of Minnesota Fishing Regulations including slot limits and limit per species, etc. but fishing participation is not required to be eligible to win. No additional raffle only tickets were sold for the 2016 tournament. Each of our participants are eligible for several door prize drawings during the tournament! View Photos from the 2016 Tournament on the JK Ice Fishing Tournament Facebook Page! Each fishing ticket contains one raffle ticket. Each of our participants was eligible for several door prize drawings during the tournament! NEW for 2014! 2nd and 3rd place prizes were awarded in most categories! Each fishing ticket contained one raffle ticket. Each of our participants were eligible for several door prize drawings during the tournament! The 3rd Annual Justin Knebel Memorial Ice Fishing Tournament was held on February 2, 2013 at Zippel Bay Resort on Lake of the Woods near Williams, MN. Thank you to this year's participants and sponsors! Each fishing ticket contained one raffle ticket. Additional raffle tickets were purchased for $5 each at the gate or from the University of Minnesota, Crookston by calling 218-281-8436 or btyrrell@umn.edu. The 2nd Annual Justin Knebel Memorial Ice Fishing Tournament was held on February 4, 2012 at Zippel Bay Resort on Lake of the Woods near Williams, MN. This prize was drawn for since no perch were caught during the tournament. Each fishing ticket contained one raffle ticket. Additional raffle tickets were purchased for $5 each at the gate or from the University of Minnesota, Crookston. Many of our participants were be eligible for several door prize drawings during the tournament! Thanks for all who sponsored and participated in the 1st Annual Justin Knebel Memorial Ice Fishing Tournament held on February 5, 2011 at Zippel Bay Resort in Williams, MN on Lake of the Woods! Many of our participants won several drawings for door prizes during the tournament!